Volvo VCADS Pro 2.40 is a professional diagnostic tool for volvo truck from 1996-2012.Volvo VCADS can read and clean fault code, brakes,engine,frame,springs,shocks and wheels. Pls notice,your computer need have COM PORT. 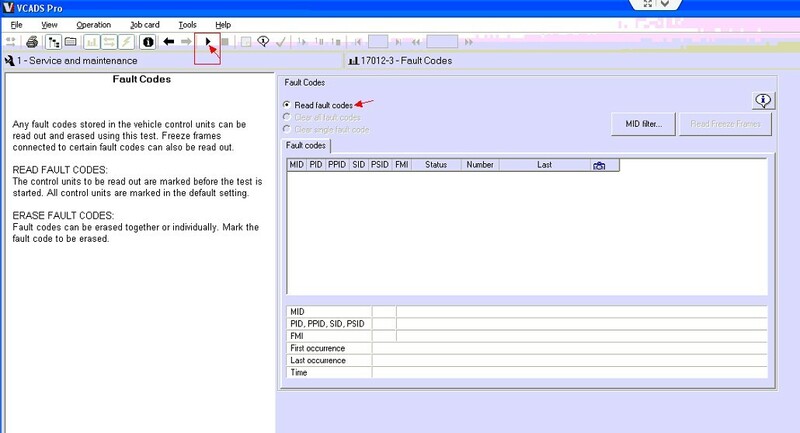 Diagnostic Program designed to read and clear fault codes. 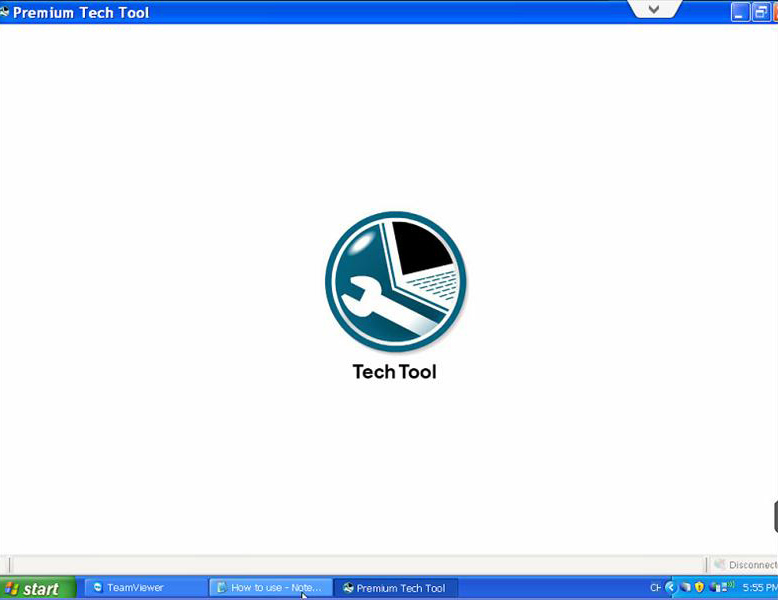 PTT is a Windows-based diagnostic application specially designed to test, calibrate and program engine parameters. This software supports VN, VT, VHD, WG, WX and AC from model year '98 forward. Tests for fault tracing of Volvo D7C, D11F, D12B, D12C, D12D, D13F, D16D and D16F engines are incorporated into PTT. Many funtions in today's modern vehicles are controlled by electronic control units(ESUs). ECUs control components such as the engine, instrumentation and certain vehicles funtions. PTT is a toolbox that bundles diagnostic (VCADS) and repair applications (Guided Diagnostics) together making it a one stop shop for the technicians. The main purpose of PTT is to support the diagnostic & repair process and to make it easier for technicians to work with the tools provided. VCADS elite software is installed on a PC. 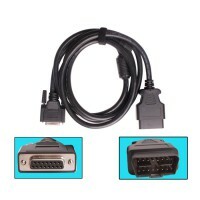 The PC is connected to the communication connector in the vehicle via the communication interface(Volvo part number 9998555). VCADS Elite provides tests and calibrations for VOLVO vehicles that are equipped with the Vehicle Electronics '98(VECTRO II) or Version 2 electronic control systtems. The application consists of a number of standrd graphical interfaces, such as graphs and continuous displays of parameters values. 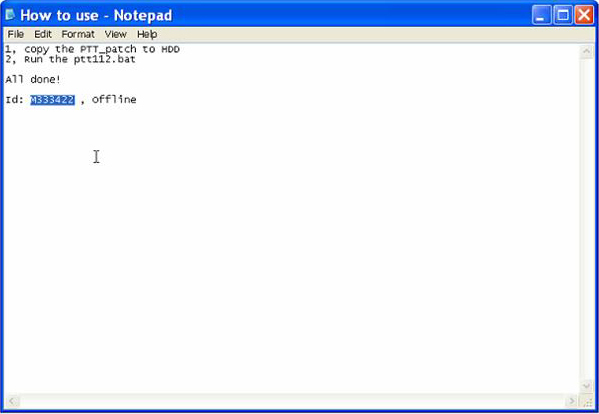 The operations are organized in the menu according to function groups. Some ECUs have changeable parameters that can be use to adjust or customize certain functions. 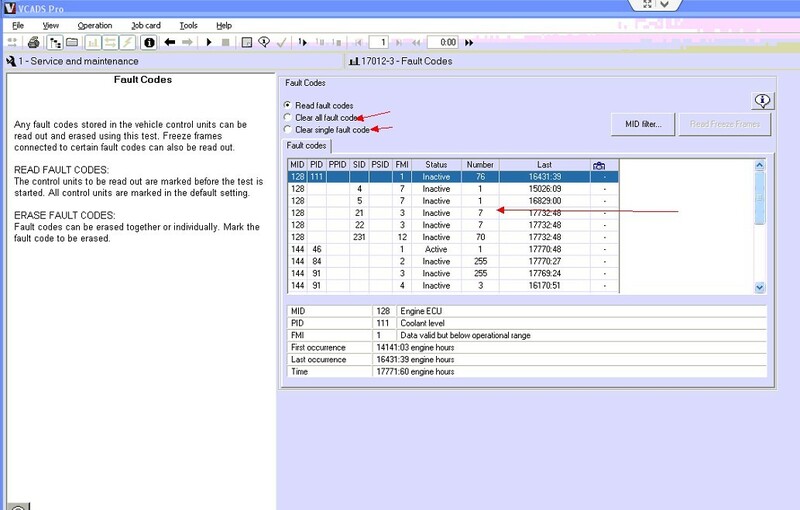 Volvo ECUs often have two types of parameters: Customer parameters and Vehicle paameters. Customers parameters can be programmed locally using VCADS Elite. 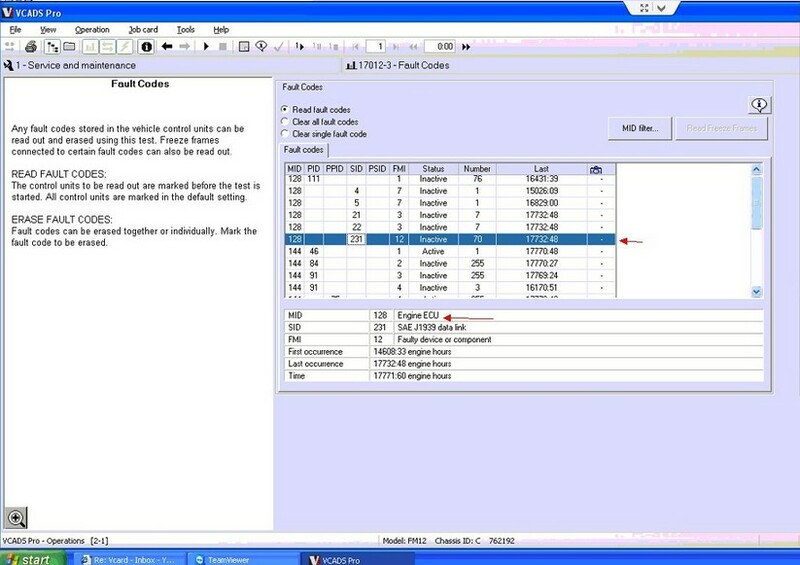 Vehicle parameters genarally are used to configure the vehicle when it is built and alteration of these parameters requires a connection to VDA(Vehicle Data Administration) at Volvo . These parameters CANNOT be read or programmedwith VCADS Elite. These changes must be performance by a Volvo Truck dealer. - The Option dialog in the Tool menu has been updated. - Manually entered chassis series are validated on the local computer. - Possibility to correct parameter values that are incorrect according to specifications. Parameters with values that are not valid are marked with red color. Previously, this situation caused an error that interfered with parameter programming. - Help desk tool is updated. The actions 1 - Update phone book and 3 - Change connection type are found under 1 - Central Communications Settings. - Campaigns which have been downloaded in intermediate storage mode but are not reported will, after 30 days, be reported as not performed for safety reasons. - If the hardware part number in the control unit differs from the hardware part number stored in the central systems, VCADS Pro will automatically check if there is an appropriate conversion kit available. If this is the case, a dialog box appears asking the user to run the conversion kit. - New procedure for downloading of new versions of VCADS Pro. - If there is unused or unreported software stored in Intermediate Storage, the user will be notified and have the possibility to view more detailed information. - Help text updated with instructions for parameter programming by templates, the new Option dialog and information about new functionality in intermediate storage. - Campaign handling will from now be reported after programming is finished and not at the next authenticated connection to central systems. - The operation conversion kit has been split into two operations: Conversion kit and Accessory kit. - Oscilloscope related operations for special tool 88890040 have updated oscilloscope software. - New version of Perf: performance application. Version number: 2.5.3.
we try on volvo fm12 2006 truck. The fault code is 128,below is the explaination of 128 fault code. A:Volvo VCADS (SH10-B) can do 16pin car,Volvo VCADS (SH10) can’t do 16pin car, also these two VCADS User ID is different. Q:What’s the Volvo VCADS Pro 2.40 (Item No. 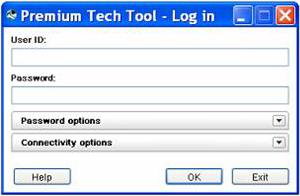 SH10-B) login User ID and password? 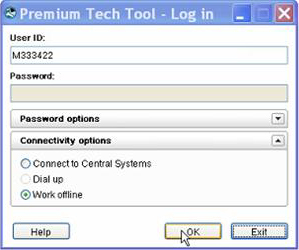 A:Please open the .txt file "How to use" and copy the ID number to the blank box under "User ID", input nothing after "Password", click "connectivity options" and tick before "Work offline", finally click "OK". For more details, please watch the video demo in the CD. Q: What is Volvo VCADS 2.35 (item NO. SH10) User ID? A: When setup Volvo VCADS v2.35.00, please input User ID: 401276, for more details please look at the "setup readme.txt", besides there is a Video demo in the CD. 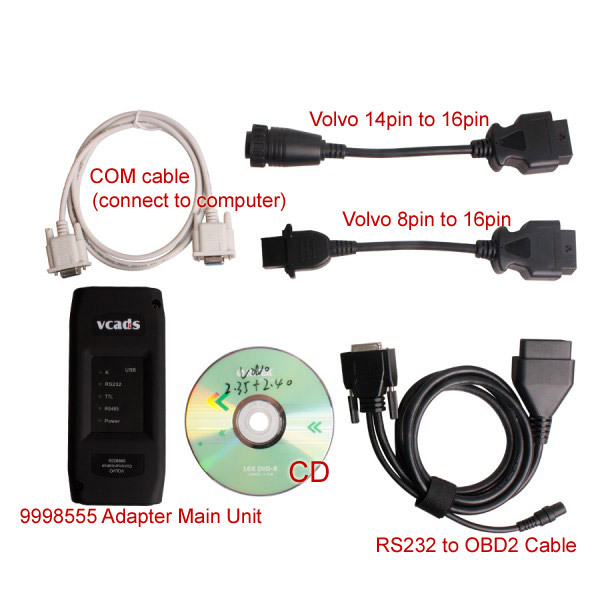 Q: Volvo VCADS has no USB cable, then which cable to connect with the computer, how to connect with the car? 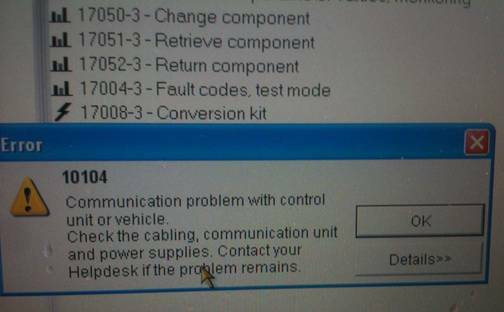 A: No, Volvo VCADS has no USB cable, it has COM cable, please input the COM cable into the computer COM port and communicate with the computer. Q: How to update Volvo VCADS? A: Once we have the newest software, we will send you via CD or via Email. Q: the Volvo VCADS software works ok on windows XP. but the control unit will not connect to the laptop. The com connection is ok. When I plug the unit into the truck diagnostic port the power light comes on and the blue USB light flashes very fast in a random sequence. I have connected it through the RS232 lead and the RS232 light on the control box does not light up at all. Q: Can Volvo Truck Diagnostic Tool Volvo VCADS Pro 2.35.00 work with airbag and gear box? Q:Can your volvo truck test my volvo penta d13 6 pin? A:Sorry,it cannot do,as we don't have 6 pin adapter for you.We only have 8 pin and 14 pin cable.